There’s nothing quite like a great puzzle game. Whether it’s gracefully organising Tetrominoes, solving mysteries in Professor Layton or simply shading in a grid of squares to make a cool picture in Picross, the sense of achievement these examples deliver is hard to top. Although, what about a puzzle game where the solution isn’t restricted by its mechanics but instead by your imagination? 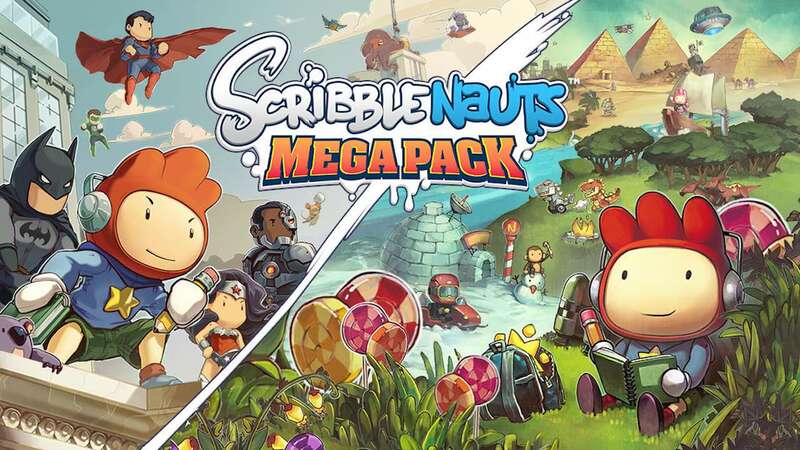 That’s what the focus of the Scribblenauts series has often been, something that Scribblenauts Showdown managed to ignore after turning a neat puzzler into an uninspired party experience. It’s great to see Maxwell and his sister returning back to a formula that works far better in the Scribblenauts Mega Pack, that combines both Wii U titles Scribblenauts Unlimited and Scribblenauts Unmasked: A DC Comics Adventure. While you may be getting two games, both actually share a lot in common. For one their stories are cute but nonetheless throwaway. Unlimited sees you going on a quest to save your sister who is slowly turning into stone while Unmasked has you team up with Batman and plenty more heroes in order to save the world. They serve as a means to keep you travelling between environments but nothing more. Both games also share the same common formula at their core too, each tasking you with venturing across a number of small 2D self-contained environments and solving tasks or problems its inhabitants have. How you go about this is by simply typing in a word, bringing it to life and using it as required. For example, you may come across an exhausted character that needs a good rest. What could you offer this poor soul? Perhaps a sofa? Or how about a masseuse? Chances are, whatever springs to mind will be in the game’s dictionary – the word count reaching as high as in the tens of thousands – and for the most part, each item or living thing will react the way you expect it to. That’s what has always made Scribblenauts such a marvel. Despite having such a long list of words in its vocabulary, an impressively large percentage of them do what you want them to. What makes this even more impressive is the fact you can even assign adjectives to anything you create giving it a further unique characteristic. Why just have a bear when you can have an angry one or even a flying one? Of course, the game does have its limits and you will find them eventually. There are instances where your word may not be there (be fair the English language is pretty big), some may simply duplicate the conjured result with another word that’s similar or some may just not do what they’d do in the real world. For me, Scribblenauts Unlimited offers the best overall experience largely thanks to its mission structure not to mention its creativity and attention to detail. Venture to a desert oasis and you’ll find missions that for the most part belong in that environment such as a firewalker who needs you to cool down his coals. In Unmasked, levels spawn random missions that are just that – random. They often feel out of place and a little uninspired in their design resulting in an adventure that’s far more uneven in quality than its predecessor. While there are still story specific tasks to tackle the balance feels off. That isn’t to say Unmasked is a bad time. There’s still some fun to be had from working your way through Gotham City and Atlantis bringing the likes of Flash and Green Lantern to life. A problem that can apply to both games though is their difficulty since you can, in theory, choose to repeat words to solve multiple tasks. For example, if you’re looking to take on an enemy or destroy something then words like bazooka and flamethrower are reliable ones to fall back on. They are so powerful it removes any sense of difficulty the game might have. It also doesn’t help that the game never really punishes you for being unoriginal in your choices. Take the opportunity to think outside the box and you will definitely get more out of your playtime with both games. While creating your nouns and adjectives to see how they interact with the world is easily the highlight of the game, it’s just a shame that the actual gameplay itself doesn’t feel as polished. Physically moving Maxwell around and grabbing items can be fiddly while the combat side of things feels basic at best. This wouldn’t be so much an issue if the game didn’t put such a big focus on actually battling, especially in Unmasked. Both games can be played using either the touch screen – in handheld mode exclusively – or traditional controls. Scribblenauts has always worked better when you are physically tapping on a screen to enter your letters and the same applies here. The whole process feels snappier and easier. Of course, if you want to play on the big screen then the game’s solution using buttons and the control stick get the job done albeit in a far clunkier and less intuitive manner. The game also supports two players with each controlling their own version of Maxwell. It’s a great inclusion especially since both have the power to summon words. The Scribblenauts Mega Pack is a great reminder of just how unique and ambitious the series once was. While Scribblenauts Unlimited is arguably the better overall game, the DC inspired version is interesting if not just to see Batman duke it out with a giant purple Tyrannosaurus rex. These games might be silly, sometimes clumsy and even a little too ambitious for their own good at times, but overall it’s hard to argue the fun to be had from a series that allows you to literally conjure up whatever pops up in your brain.